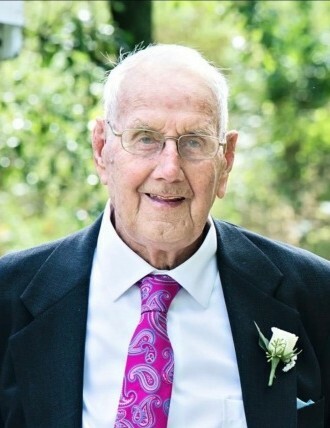 John Allen Elzinga, 86 of Charlevoix, passed away unexpectedly Friday, February 8, 2019. He was born April 25, 1932 in Banks Township the son of Albert and Gertie (Veenstra) Elzinga. John graduated from Ellsworth High School in 1950 and upon graduation took over the family centennial farm in Atwood. John with his wife Phyllis owned and operated Elzinga’s Farm Market for over 40 years. John was an active member of the Atwood Christian Reformed Church. He was the organist for 70 years as well as an elder and deacon. When the Atwood church closed, he became a member of the Ellsworth Christian Reformed Church. John was involved in many aspects of the community. He was on the Antrim County Farm Bureau Board, the Ebenezer Christian School Board and was the Banks Township Treasurer for many years. John was also on the 4 Front Credit Union Board, the Charlevoix Planning Commission and a counselor at Camp Quality. Spending time with his family was very important to John. In his free time, he enjoyed working in his garden, tending his roses, and planting over 60 varieties of trees on the farm. He also enjoyed traveling, deer camp in Grand Marais, and watching sports on TV. John could often be seen in summer parades driving his yellow truck “Buttercup”. On August 31, 1957 he married the love of his life Phyllis Williams who survives. Also surviving are his daughters Susan (Dave) Whiteside of Jacksonville, FL, and Cheryl Elzinga of Grand Rapids, granddaughter Emma Matthew of Alto, MI, brother Allen (Claudette) Elzinga of Traverse City and many nieces and nephews. He was preceded in death by his parents, 2 brothers Hank and Mart Elzinga, and 2 sisters Ona Baker and Nettie Bolser. Funeral services will be held Wednesday, February 13, at 11 a.m. at the Ellsworth Christian Reformed Church with Pastors James Zwier and Dave Kroon officiating. The family will receive friends Tuesday, February 12 from 2 to 4 p.m. and 5 to 7 p.m. at the Hastings Chapel of Mortensen Funeral Homes in Ellsworth. In lieu of flowers memorial contributions can be given to Good Samaritan Family Services, PO BOX 206, Ellsworth, MI 49729 or Camp Quality, PO BOX 345, Boyne City, MI 49712. Arrangements have been handled by the Hastings Chapel of Mortensen Funeral Homes. Please sign his online guestbook www.mortensenfuneralhomes.com.